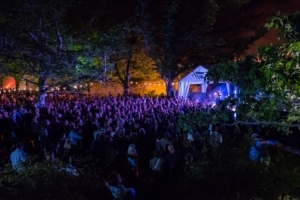 FAC offers three unique spaces for concert hire, year round – the South Lawn, Front Garden and Inner Courtyard. We can cater for high-profile international acts, national and local performers. 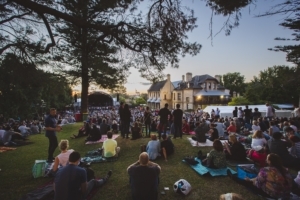 Previous acts include Nick Cave, CW Stoneking, Lauryn Hill, Chet Faker, Passenger, James Bay, Hot Chip, Paul Kelly, The Waifs, Archie Roach, PJ Harvey and Flying Lotus. All concerts have a 10pm curfew. 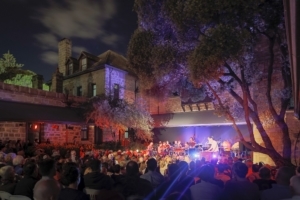 No bookings can be made until Fremantle Arts Centre has approved the act. All shows are 18+ unless otherwise negotiated. Ticketing is run through fac.oztix.com.au, Oztix outlets and Fremantle Arts Centre. The grounds are not available for weddings, meetings, or other private functions. Canvas Café, nestled within FAC’s building, is available to hire for private events. To find out more or make an enquiry contact David Craddock, Events Coordinator at [email protected] or 9432 9568. Space: Approx. 3,500m2 of split level (3 tiers) grassed lawn, overlooked by FAC’s gothic heritage building. Stage: 8m x 10m x 1m, with limestone walls and a wooden top. Power: 3 phase: 2 x 32 amp, single phase: 2 x 15 amp, 2 x 10 amp. Security & Facilities: We provide security, additional toilets as required, fencing (excluding the stage barrier), first aid, food stalls, bar and all clean up duties. Hire Charge: $5.50 per paying head (guests limited to 100) with a minimum fee of $8,800. This fee may increase for public holidays. Space: Approx. 900m2 grassed courtyard on FAC’s northern border, set under London Plain trees. Stage: 8.4m x 6m x 0.6m and stage cover. Power: 3 phase: 1 x 20 amp, single phase: 1 x 15 amp, 5 x 10 amp. Security & Facilities: We provide security, toilets, fencing (excluding the stage barrier), food stalls, bar and all clean up duties. Production: Nexo PS15 PA, sound engineer and in house lighting provided (full spec sheets available on request). Hire Charge: $4.20 per paying head (guests limited to 75) with a minimum fee of $2,500. This fee may increase on public holidays. Capacity: 400 general admission or 300 seated. Space: Approx. 350m2 courtyard in the centre of FAC’S historic building. This enclosed grassed area provides an intimate setting with good acoustics. Power: 3 phase: 1 x 20 amp, single phase: 2 x 10 amp. Security & Facilities: We provide security, toilets, fencing (excluding the stage barrier), bar and all clean up duties. Production: Nexo PS PA, sound engineer and in house lighting provided (full spec sheets available on request). Hire Charge: $3.80 per paying head (guests limited to 50) with a minimum fee of $990. This fee may increase on public holidays.